I did not mean to be inhospitable when I closed my blog to comments. My Facebook wall is full of interesting discussion which I have found so educational. But my blog was spammed constantly with commercial ads & mountains of abuse from Zionist supporters of Israel. I’m a tough cookie but that stuff wears thin real fast–especially the low level of abuse they employed to bring me to my knees in defeat. Mostly it took me hours to get rid of. So it was easier to just close down the comment gizmo. If you have anything you want to tell me, email or find me on Facebook. Unless you’re a right-winger. Then just go away. It’s always so heartening to see the response to posts about Kashmir because there’s long been a news blackout about India’s occupation & like most of us, I knew nothing about it. After being on Facebook, several Kashmiri friends badgered me to post about their freedom struggle. I had every intention but put them off for a long while. They’re a relentless crowd & they drove me nuts with the badgering. I would give them deadlines, fail to meet them, & they would start a new round of badgering. They won’t be faulted for persistence. India should take note. Finally, I got to it &, as is common in US libraries on foreign conflicts, had a lot of trouble finding good sources of information or at least information not guided by US State Department-think. I am still working to grasp its dynamics & have found my Kashmiri friends, still persistent, an inexhaustible source of information. I have also found Indira Krishnamurti Pradhan a valuable source of understanding about India’s role. So I’m no authority on Kashmir but am won over to supporting their struggle for freedom from Indian dominance & military occupation & am committed to explaining the politics of their movement which I have come to respect deeply. I say all this not to defend myself against the rightwing Kashmiri who accused of a ‘white savior complex’ but to tip my hat to my Kashmiri friends for badgering so shamelessly & relentlessly & using social media to build international solidarity for their struggle. A distinctive feature of occupation in both Kashmir & Palestine is the ruthless targeting of young people by occupation forces. It’s not an accident, or that hundreds of young people just get in the way of bullets; it’s a strategy to demoralize & terrorize by murdering youth. Grief becomes a prevailing emotion feeding rebellion because you cannot get away with killing the young & expect subservience. There’s a price to pay for barbarism. This is the mother of Syed Mufeed Bashir who was killed yesterday in Kashmir. 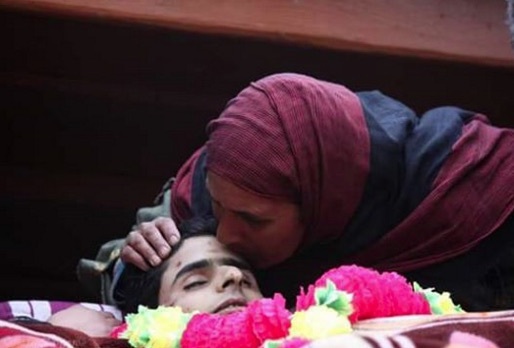 His death is reported with the same tiresome scenario dished out by Indian military officials to justify assassinations of youth in what they call “encounters”: They claim he was a “militant” on the run. They received a tip he was in a certain town so they cordoned the entire area & began shooting & lobbing grenades. Even from a military standpoint, it doesn’t make sense. Though from the point of view of occupation, it’s the modus operandi. They claimed he belonged to an armed resistance group. So what? Had he committed any crimes? Shot at anyone? Done anything to break the law? Or does he just have no political rights of association? How do they explain why so many unarmed young people are murdered by Indian occupation forces? Or thousands disappeared? Massive protests that went on for hours were held in his hometown & in other towns after they heard news of his assassination. A complete shutdown was observed in his district. Thousands formed a funeral cortege to honor him. We may not agree that armed resistance is the wisest strategy–especially when you’re outgunned by nearly a million soldiers. We can’t even be certain he was armed, as the Indian military claimed after they murdered him. We only know people have a right to throw off brutal oppressors by any means necessary. We respect young Syed Mufeed Bashir & express our condolences to his family, friends, & fellow activists. May he Rest In Peace. End the Indian occupation of Kashmir! Down with feudalism! A political achievement 300 years overdue. Or is it 400 years now? Some people think me intolerant in my judgements of feudal moochocracy. They’ve misunderstood me then since I mean to ridicule & excoriate the abominations of feudalism in the harshest, cruelest terms, leaving no contempt unexpressed. No puny intolerance for me on that score. Any system based on inequality, subservience, autocracy, serfdom which takes money from the poor to sustain the indolent & bends the knee to people in tiaras needs to be blasted decisively off this planet & equality among human beings deeply rooted. Inequality is the root of all evil; human solidarity the foundation of peace & justice. The great achievement of capitalism was overthrowing feudalism in the great revolutions but it hasn’t completed the job in many places. Moochocracy still exists in nearly 30 countries & everywhere it exists is an impediment to democracy. So look for no mercy from me about a monstrous system that holds some superior & the majority inferior. It’s a stinking political corpse. It’s time for the Age of Aquarius where all are deemed brothers & sisters. Subservience be damned.